Approximately 200 million children less than five years of age are identified at risk of developmental delays and most of them are from developing countries . Early identification of vulnerable and at risk children of developmental delays as well as effective early intervention improves the lives of these children [2-4]. World Health Organization (WHO) is striving to develop global indicators of child development to promote early child development. Many countries are striving for the development of local indicators that are culturally sensitive, acceptable, and representative that can identify vulnerable children . Moreover, developmental assessment is the integral part of any early childhood development programs. There are many reasons for this, such as sensitive period of brain development in early years, its link with lifelong trajectories of health, education and earning opportunities in later life, that make the track of developmental assessment crucial during early years particularly from birth to three years . One of the first steps to assess the effectiveness of an ECD programs is to do the accurate child developmental assessment using culturally sensitive and reliable measures. Most of the child development screening tools used in the developing countries were developed and validated on western children and on urban population [7-9]. Although it is a practice to adapt these tools according to cultural settings and norms, some of them are only translated or adapted with minimum consideration of the validity, reliability and cultural relevance . In addition to this because of the non culture relevancy of many items, they just give comparison among group but do not provide true pictures of child abilities and it is not cost effective exercise [11,12]. Most of the standardized assessment tests are material loaded and require large amount of time for assessment. Majority of the child assessments is done in clinical settings and used for diagnosing the deficiencies or disabilities. These are not used for routine checkups to track of child development over different time periods . Some assessment tools only cover one or two domains of development and don’t cover all developmental domains in holistic manner. Recently some tests have been developed in developing countries but these have very focused population coverage [14,15]. Epidemiological studies give evidence that developmental assessment and screening most of the time is confined to the clinical settings and performed by professionals not by community health workers. This point towards, there is a need for more widespread screening at community with a culturally sensitive tool performed by locally trained paraprofessionals. The main objective of this study was to develop such a simple and accurate tool that can be used in community setting, not be material loaded, easy to administer and that can effectively assist parents to identify developmental problems and keep record of child development surveillance [16,17]. 5) Empower front line health workers with necessary skills so that they can effectively coordinate a link between family and health services for a better child care. The CDA tool development process consisted of three broader steps that overlap with many small steps: (1) Development of the CDA tool (2) Field testing of the CDA tool and (3) External Review (See Figure 1). Figure 1: Flowchart of the tool development process. A multidisciplinary team of experts comprising of psychologist, physicians, community health nurses, public health practitioners, epidemiologist, sociologist and educationists was formed to conceptualize and develop the basic theoretical framework for child assessment and education tool. The step of reviewing literature is essential for any tool construct. Extensive literature review was done to compile existing tools across many disciplines to assess growth and development. An item pool was generated from several published and unpublished standardized measures for child development to set the basic lay out of the CDA tool. The next step was to review of pooled indicators and educational material for their cultural relevancy and adaptation. The most appropriate critical and distinguished age appropriate indicators were selected according to the child age, developmental domain and relevancy with the universal and culture norms. For advice for caregiver section evidence based best nurturing practices were selected and adapted related to child health, safety, nutrition, stimulation, hygiene and sanitation, care practices at birth and disciplinary actions. 5. Advice for caregiver (best nurturing practices related to nutrition, health care, hygiene, safety, play and stimulation, disciplinary practices and at birth practices). Face value and layout of the CDA tool was finalized with the concept that child assessment session should be accompanied by advice for the caregiver. Finally, assessment schedule and scoring criteria were finalized i.e. child assessment to be done on monthly basis during the first year of life, and then on quarterly basis in the home setting. The rationale for this routine is based on the growth monitoring schedule already recommended by WHO  and is already in practice in various developing countries. It is logically and operationally more feasible to tag on assessment and advice about developmental status to the existing growth monitoring routines. The literacy level of many developing countries is very low and much worse in women. Keeping this in mind, all assessment and educational indicators were illustrated to visually communicate the developmental status of a child and to provide educational messages for caregivers (Figure 2). Figure 2: Pictorial layout of CDA tool. Child assessment requires some standardized material to reduce the biasness and enhance uniformity in the assessment procedure. A very minimum material loaded kit, consisting of 16 items was arranged, that were easy to administer, low cost and indigenous (Appendix 1). In order to facilitate paraprofessionals and parents in improving their day to day interactions with children, the ‘community based workers guide’, was also developed as a CBWs standard protocol for administration of child assessment and caregiver’s education. The CDA tool was initially pilot tested in small scale to check the ease of use and to calculate the actual time and item flow before wider field testing. The team of researchers conducted the pilot testing on children in a private day care center and health care setting (vaccination center). 1) Feasibility and operationalization of the CDA tool in a community setting. 2) Comprehension of the illustrations by the caregivers. 3) Identify the norms of physical growth and mental development in a developing country set up. Study measurements comprised demographic information, assessed by caregiver’s interview based on a structured questionnaire, child’s anthropometric assessments according to standard WHO protocol, and child development assessment on the basis of CDA Tool’s “community based workers guide”. Opinion and comprehension of the illustrations by the caregivers were also recorded. Ethical approval for the study was taken from University Ethical Review Committee and verbal informed consent was taken from caregivers, while children with diagnosed severe mental retardation, physical disability or having physical illness at the time of assessment were excluded from the study. Sampling strategy was devised on the basis of assessment schedule that monthly assessment for initial 12 months and for quarterly basis up till 3 years, cumulated to form 20 age groups. On average, 50 children were selected for the assessment in each age group. Each and every eligible child according to the assessment schedule was selected from the geographical area. Data collection was performed in two stages. In the first stage, mapping team visited the area and mapped each household. They identified the eligible children by determining their date of birth on the basis of birth records, if available, otherwise primary caregiver information was considered sufficient. In addition, after obtaining informed consent the convenient time of child assessment was also discussed with the caregiver. At the time of assessment, care was taken that the child’s age should be in the +7 days of his/her respective age group. During the second stage, assessment team comprised of two members who were part of research team visited the house, assessed the child and collected the required information from the caregivers. The whole assessment took about 20-40 minutes per child. The assessment was done at household level and caregiver was advised to provide non-intrusive environment as well as not to prompt the child during assessment. Team comprised of two members assessed a single child and members of the team were from the same group who participated in the conceptualization and consolidation stage. Preliminary editing was done immediately after the interview. The data collection forms were checked by a field supervisor for internal consistency, missing information and illegal entries. Office editing was done for coding purposes and completed form was handed over to data management team. For quality assurance, data collection process was regularly monitored by the field supervisor. Daily debriefing were carried out among team members to identify the issues and challenges during the field testing process. In addition, refresher training of the assessment team members was conducted by field supervisor on regular basis. The study population was heterogeneous in its ethnic distribution. Distribution of boys and girls was almost equal. Overall parental literacy was low. However, as compared to the paternal, the maternal illiteracy was significantly higher. About 10% of the mothers and 22% of the fathers had some level of college education. Primary bread earner for the family was father, while only 7% of the mothers were gainfully employed. Table 1 summarizes the demographic characteristics of study population. Table 1: Demographic characteristics of study population. The basic anthropometric measurements considered in the instrument were body weight, height and head circumference of the child (see Table 2). The indices considered in the study were height for age, weight for height, and weight for age. They were categorized at the -2 SD cut-off level according to WHO protocol to form stunting, underweight, and wasting indicators respectively. Stunting children was 23%, underweight 26% and wasting was about 12%. Association between socio-demographic factors and nutritional status is given in Tables 3 and 4. Table 2: Physical growth characteristics by age groups. Table 3: Development characteristics according to child nutrition status for age. Table 4: Percentage distribution of age appropriate development with respect to item considered in respective developmental milestones -dark shaded areas represents at least 50% of the observations were age appropriate for the item. Assessment of psychometric properties for the measures of developmental status has been done at various levels. Contents were validated by extensive literature review and expert opinions during the conceptualization and consolidation phase. Concurrent validity was performed in the study, for this purpose the association of anthropometric attributes against psychometric assessment was evaluated. Face validity of CDA tool was found good, because the layout and administration of indicators was acceptable and understandable by the assessors. The pictorial message was understandable by the caregivers and elder children; they appreciated the layout of CDA tool. No significant difference was found between the male and female children with respect to indicators of psychomotor, language, and emotional development. This finding is congruent with the scientific literature regarding association between gender differences and mental development . General malnutrition: Underweight children demonstrated significantly delayed performance for gross motor, fine motor, and language, emotional and cognitive development. Acute malnutrition: Wasted children demonstrated significantly delayed development for psychomotor indicators. Chronic malnutrition: Stunted children performed significantly delayed for gross motor; language and cognitive development (see Table 3). The CDA tool was revised on the basis of statistical results and through feedback and discussion with caregivers. For child assessment component; distribution of each item of the psychometric assessment was considered in terms of accelerated, normal or age appropriate and delayed development. Those items which got at least 50% of distribution in normal category were retained in that specific age group. The 50% cut-off was kept because it was the least possible number which could have clearly distinguished the three categories (Table 4). If majority of the children exhibited in the delayed group than that item was shifted to the previous month as it was considered difficult for that age group to perform. If majority of the children performed accelerated development than item from the next month was brought into that category. In this manner 30 items were shifted in overall CDA tool either in previous or next age group. For field-testing purposes each item was categorized into delayed, accelerated and normal options. These options were only valid for the tool development purposes and establishment of the norms. Then, from operational perspective of research or service provision, normal and delayed development options were kept and accelerated development option was eliminated from the CDA tool. During discussion and feedback from caregivers, items of each domain were reconsidered with respect to its mode of administration descriptor and illustration and modified accordingly. The modified version of CDA tool was finally evaluated by a panel of independent multidisciplinary external reviewers including national and international experts from the field of child psychiatry, child psychology, community health nursing and family practice. The objective was to get professional opinion on the construct and content validity of the revised draft of the CDA tool and suggestions about how to optimize its effective implementation in a community setting. Overall expert’s response was very encouraging; they appreciated the whole concept of combining assessment and advice together and its use that will be beneficial in any ECD program. Experts agreed that assessment section is constructed to measure the holistic child development and individual items are relevant to the domains of development, are discriminatory in nature and arranged in a progression manner. They appreciated the CDA tool face value and item construct for its appropriateness to the culture. Few content and structural changes were suggested that led to further modification in the educational component of CDA tool, e.g. : 11 month-Repeats acts that are praised, experts asked how it was different from Obsessive compulsive, so we added the purpose and made the instruction clearer”. The CDA tool is a resource tool for frontline health providers for child assessment and parent education that fulfills the dire need for community based ECD programs. It can be used as a surveillance tool to track child development during birth to three years. CDA tool provides rapid and comprehensive child assessment in five developmental areas; these are four gross motor, fine motor, language and cognitive development. This tool is an empirically derived measure that assesses growth and development during first year on monthly basis and quarterly in second and third year of child’s life. It is more relevant with Pakistani culture however can be used across the globe in resource poor countries. Professional assessment is expensive, resource intensive and difficult to cover large populations. This is why in population based research studies parent report questionnaires are widely used [21,22], but validity of parent report is questionable because of the personal bias and low educational attainment of parent’s especially in developing countries [23,24]. The CDA tool is intended for use by community based workers (CBWs) that give opportunity for actual and direct child assessment and serve as a guide for mothers to observe the growth and development of their children and refer to the age associated information provided by the CDA tool with the consultation of CBWs. As we have very limited child care assessment resources in developing countries and mostly used milestones checklist which do not have clear child assessment criteria, CDA tool has clear criteria for achievement and risk for development, therefore professionals, pediatricians, psychologists, nurses and other child-care professionals can used CDA tool to screen for developmentally relevant problematic areas and educate caregivers during home visits and routine health checkups. This routine ongoing assessment save time of families and reduce financial cost of over referral and extensive assessment . The CDA tool has high face validity, pictorial presentation of all the content in child assessment and caregiver’s advice section allows the opportunity for caregiver, to understand the messages and child developmental milestones with the consultation of frontline workers. High face value of the tool and pictorial expression, open the communication between health care providers and parents that increases the collaboration among them and encourages parents to create favorable and stimulating environment for child development and learning, apply positive parenting and increase school readiness . Harkness et al. highlighted that culture has major effect on parenting practices that produce difference in children’s development. All the items included in the CDA tools are socially, culturally and developmentally valid that acceptable to the Pakistani population and are found noninvasive for parents and children . The initial field testing for norms development of CDA tool indicates sound psychometric ability in terms of its contents’ validity as well as concurrent validity, especially for physical health indicators and some of the socio-demographic variables. All developmental indicators met the established validity and reliability criteria that are at least 50% child population achieving the indicator. In a study Simien et al. kept the 30% frequency for normal behavior and 10% frequency for problematic behavior. Most of the child developmental problems and disabilities are detected by front line health care providers during routine health checkups of children and usually used invalid checklists with unclear scoring criteria and consist of number of items that took more than 30 minutes time. 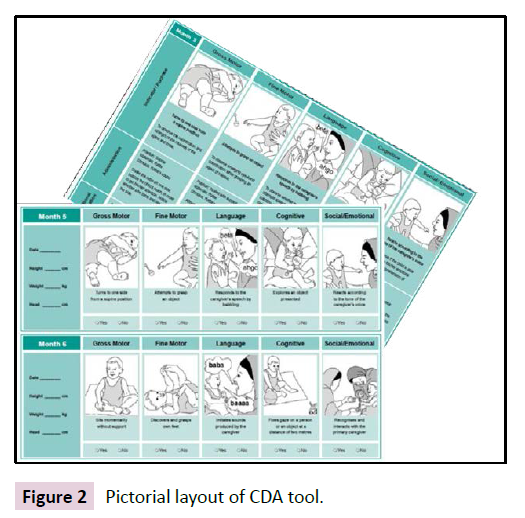 The CDA tool has only 5 critical indicators for each age period, only one item in each developmental domain which hardly takes 10-20 minutes to complete. This brief screen is easy to administer and is used to track the child development, identify the child who are at risk of development and who require more intensive assessment and referral for early diagnosis and intervention. We are recommending the use of CDA tool in child health surveillance program both in community setting and health facility setting to get the broader picture of child skills and abilities over different time periods in a continues manner with timely intervention and corrective measures that is recommended, keeping in mind that onetime assessment or observation do not give clear idea about child skills and weaknesses in social environment [30-33]. Cost, staff education and extensive training is another issue that is associated with several standardized tools , CDA tool is intended to use by community based workers who have ten to twelve grade of education and requires minimum basic training on concepts of child development, CDA tool’s assessment and ability to develop referral system with health facility is available in the community. “Advice for caregiver section” of CDA tool gives opportunity for caregivers to develop conducive environment for child’s learning and development. All the suggestions given in the “advice for caregiver section” emphasized on the best ECD practices that is related to child’s health, nutrition and stimulation” these messages were developed with through literature review and consultation of experts opinion in terms of child health and developmental benefits and cultural relevancy. One of the key feature of these advised is the pictorial expression, so the illiterate women living in the disadvantages neighborhood can easily understand the educational message as highlighted by Akhund et al. . The caregivers’ active interest and enthusiasm during pre testing in this educational section and their comments regarding education component also showed the relevance of information for them. One major limitation of this study was the cross sectional nature, although the study population was heterogeneous however for the population norms development, an extensive equally representative ethnicity, cluster based study recommended. Again for criterion validity, predictive validity was not possible due to the limitation of the cross sectional study design ECD is relatively a new field we tried to compile many best ECD practices in caregiver’s advice section but due to structure and layout limitation many were left that can be incorporated according to the culture while implementing a parenting education program. The field trial of CDA tool gave us very initial findings about psychometric properties of the CDA tool, despite the promising results, future research is necessary to develop population norms and to establish concurrent validity with a referenced goal standard like Bayley or other screening tool. Development of norms on CDA tool for special children and hospital population is also recommended which would provide further evidence that how the tool works on special population. Parents report about child development is also an integral part of child assessment that was not addressed in CDA tool because of the standardized procedure of assessment and reporting bias elements however in a surveillance program addressing parents’ concerns will be beneficial and support in early identification of delays . Usually, screening tools do not give complete picture and provide diagnosis, so careful through assessment is needed if positively identified on CDA tool and some time has over-referral tendency. Lastly, this study did not assess other contextual factors that effect on child development and should be considered such as family size, neighborhood and day care setting participation. The thoroughly planned steps of CDA tool development and its field trial suggested that there is great utility of CDA tool in ECD programs and the CDA tool can serve as a useful and valid measure of child assessment and advice for caregivers in an ECD parenting program that can be used by trained frontline health workers. We recommend incorporating the CDA tool in country wide basic health care surveillance system and applied as two stages screening system that can support in early identification of child developmental problems during home visit by frontline health care worker or early childhood practitioners and provide early intervention by educating mothers to develop favorable environment for child development that is followed by multi experts assessment for children who are at risk of developmental delays and disabilities [35,36]. This research was supported with funding by the Embassy of the Kingdom of Netherlands and Aga Khan Foundation Pakistan. We thank all of the experts and research assistants who provide feedbacks on the development of tool and participated in the field testing with the enthusiasm, without their efforts, this achievement was not possible. We are also thankful to all mothers, children and families who consent to participate in this study. Last but not least we are thankful, Dr Camer Vellani and Dr. Jim Irvine for the advices in all steps of the development of CDA tool. Sally GM, Yin BC, Santiago C, Paul G, Linda R, Barbara S et al. (2007) Developmental potential in the first 5 years for children in developing countries. The Lancet 369: 60-70. Patrice LE, Maureen MB, Jere RB, MeenaCdM, Paul JG, Lydia K, Reynaldo M, Mary EY et al. (2007) Child development in developing countries 3: Strategies to avoid the loss of developmental potential in more than 200 million children in the developing world. The Lancet 369: 229-242. Shonkoff JP, Phillips DA (2003)Board on Children & Families Committee on Integrating the Science of Early Childhood, D. in From neurons to neighborhoods: The science of early child development: National Academy Press Washington, DC. Young ME (2002)From early child development to human development: Investing in our children’s future. Washington, DC: World Bank. Zarmeneh A, Taj F, Ibrahim S (2011) Missed opportunities in surveillance and screening systems to detect developmental delay: A developing country perspective. Brain Dev 32: 90-97. Glascoe FP (2000) Early detection of developmental and behavioral problems. Pediatrics in Review 21: 272-280. Bayley N (1993) Bayley Scales of Infant Development. (2nd ed.) San Antonio, TX: The Psychological Corporation. Frankenburg WK, Dodds J, Archer P, Shapiro H, Bresnick B et al. (1992) The Denver II: a major revision and restandardization of the Denver Developmental Screening Test. Pediatrics 89: 91-97. Brothers KB, Glascoe FP, Robertshaw NS (2008) PEDS: developmental milestone:an accurate brief tool for surveillance and screening.ClinPediatr 47: 271-279. Tsai HLA, Megan MM, Clara P, Jane S (2006) Adaptation of the 36-month Ages and Stages Questionnaire in Taiwan: Results from a preliminary study. J Early Interv 28: 213-225. Geisinger KF (1994) Cross-cultural normative assessment: Translation and adaptation issues influencing the normative interpretation of assessment instruments.Psychol Assessment 6: 304-312. Hilton A, Skrutkowski M (2002) Translating instruments into other languages: development and testing processes." Cancer Nurs 25: 1-7. Pinto-Martin JA, Dunkle M, Earls M, Fliedner D, Landes Cet al. (2005) Developmental stages of developmental screening: steps to implementation of a successful program. Am JPublic Health 95: 1928. Khan NZ, Muslima H, Begum D, Shilpi AB, Akhter S, Bilkis K, Begum N, Parveen M, Ferdous S,Morshed R et al. (2010) Validation of rapid neurodevelopmental assessment instrument for under-two-year-old children in Bangladesh. Pediatrics 125: e755-e762. Gladstone M, Gillian AL, Umar E, Nyirenda M, Kayira E, Nynke RVDB, Smyth RL et al. (2010) The Malawi Developmental Assessment Tool (MDAT): the creation, validation, and reliability of a tool to assess child development in rural African settings.PLoS medicine 7: e1000273. Glascoe FP (2003) Parents' evaluation of developmental status: how well do parents' concerns identify children with behavioral and emotional problems? ClinPediatr 42: 133-138. Glascoe FP, Dworkin PH (1995) The role of parents in the detection of developmental and behavioral problems. Pediatrics 95: 829-836. Population Census Organisation (1998) Pakistan Census Report. Government of Pakistan. Onis MD, Organization World Health (2006) WHO child growth standards: length/height-for-age, weight-for-age, weight-for-length, weight-for-height and body mass index-for-age: methods and development. Ardila A, Rosselli M, Matute E, Inozemtseva O (2011) Gender differences in cognitive development. DevPsychol 47: 984-990. Carissa AG, Matthew JM, Cappa C, Durkin MS (2009) Child disability screening, nutrition, and early learning in 18 countries with low and middle incomes: data from the third round of UNICEF's Multiple Indicator Cluster Survey (2005-06). The Lancet 374: 1831-1839. Johnson S, Marlow N, Wolke D, Davidson L, Marston L, O'Hare A, Peacock J, Schulte J (2004) Validation of a parent report measure of cognitive development in very preterm infants.Dev MedChild Neurol 46: 389-397. Oliver B, Dale P, Saudino K, Petrill S, PikeA, Plomin R et al. (2002) The Validity of a Parent-based Assessment of Cognitive Abilities in Three-year Olds.Early Child Dev Care 172: 337-348. Goodman R, Ford T, Simmons H, Gatward R, Meltzer H et al. (2000) Using the Strengths and Difficulties Questionnaire (SDQ) to screen for child psychiatric disorders in a community sample. Br J Psychiatry 177: 534-539. AkhundS, Avan BI (2011) Development and pretesting of an information, education and communication (IEC) focused antenatal care handbook in Pakistan. BMC research notes 4: 91. Whaley SE, Jiang L, Gomez J, Jenks E (2011) Literacy promotion for families participating in the Women, Infants and Children program. Pediatrics 127: 454-461. Harkness S, Super CM (2002) Culture and parenting. Handbook of parenting 2: 253-280. Rydz R, Shevell MI, Majnemer A, Oskoui M (2005) Topical review: developmental screening. J Child Neurol 20: 4-21. Simien PM, McCain AP, Kelley ML (1997) The development of the toddler behavior screening inventory. J Abnorm Child Psychol 25: 59-64. Small HH, Marks K, Squires J, Nickel R (2007) Impact of implementing developmental screening at 12 and 24 months in a pediatric practice. Pediatrics 120: 381-389. Pinto-Martin JA, Dunkle M, Earls M, Fliedner D, Landes C (2005) Developmental stages of developmental screening: steps to implementation of a successful program. Am J Public Health 95: 1928. Scherzer AL (2009) Experience in Cambodia with the Use of a Culturally Relevant Developmental Milestone Chart for Children in Lowâ€?and Middleâ€?Income Countries. J Policy Pract Intellect Disabil 6: 287-292. King TM, Glascoe FP (2003) Developmental surveillance of infants and young children in pediatric primary care. CurrOpinPediatr 15: 624-629. Boyle J, Gillham B, Smith N (1996) Screening for early language delay in the 18-36 month age-range: the predictive validity of tests of production, and implications for practice. Child Lang TeachTher 12: 113-127. Yousafzai AK, Lynch P, Gladstone M (2014) Moving beyond prevalence studies: screening and interventions for children with disabilities in low-income and middle-income countries. Arch Dis Childhood, archdischild-2012-302066. Maulik PK, Darmstadt GL (2007) Childhood disability in low-and middle-income countries: overview of screening, prevention, services, legislation, and epidemiology. Pediatrics 120 (Supplement 1), S1-S55.